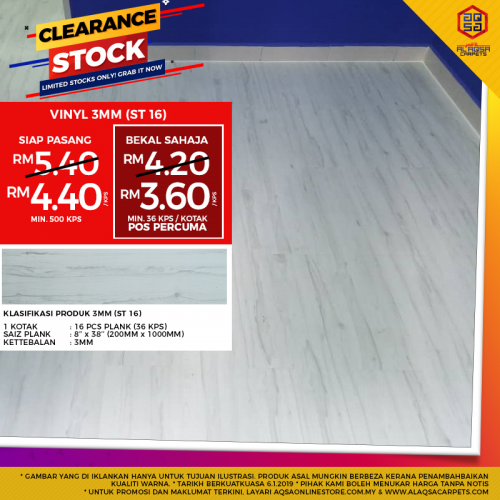 Classified » Business & Office » Businesses for Sale » Stock Clearance Sale For Wood Vinyl- Buy Now! Save More! STOCK CLEARANCE SALE FOR WOOD VINYL- BUY NOW! SAVE MORE! Wood Vinyl helps make your room look more spacious and lends a stylish, contemporary feel to the whole interior. Vinyl plank flooring is easy to clean as well as waterproof, making it an excellent choice for wood-floor effects in kitchens and bathrooms. We will guide you through the installation and everything else you need to make sure your new floor will be just as beautiful as you want it to be! Thinking about doing it yourself? Don't worry, it's fast and easy!??? ?